The material provided in this web site is provided for information only. The information provided should in no way substitute for a medical professional. You should seek professional advice regarding any concerns about your condition or treatment. 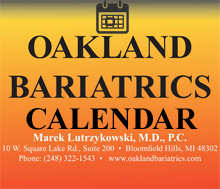 Oakland Bariatrics makes no warranties either stated or implied. Oakland Bariatricsis not responsible for damages for misuse of information obtained from this site. The information provided by this site does not in any way endorse or recommend a treatment or procedure. Links may be provided to other informative sites. Oakland Bariatrics has no control over the information provided via the links and is not liable for information provided by the links. Use the links at your own risk.